Maria Sharapova this year will turn 30 years old. Fans believe that it's time for the tennis player to get married and give birth to the first child, but the athlete does not hurry up to get a family. That is why a new photo on her Instagram surprised followers: in the picture shared to Instagram the blonde is seen with a little girl. The charming little girl turned out to be Sharapova's godchild. 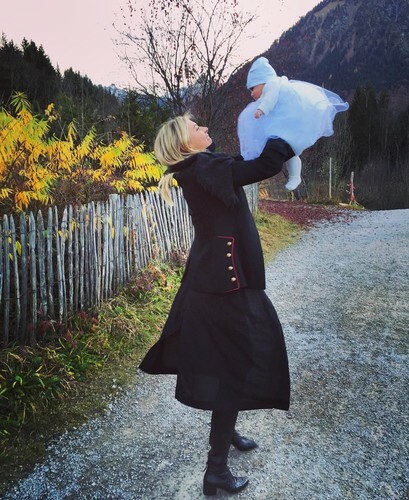 Maria Sharapova shared a touching photo on the Net with her goddaughter. The picture was taken, obviously, in a village or a holiday village. The tennis player is holding a little girl in her arms, dressed in a soft blue dress with a lush skirt. Not having read the caption, Sharapova's followers sounded the alarm: when the champion managed to give birth to the firstborn? Why does no one know about this? But especially attentive subscribers still noticed that Maria wrote: "The day with my goddaughter." Who is the parents of charming girl, the tennis player did not specify. The fans agreed that the role of the young mother suits Sharapova. However, the blonde has not met the right man whom she would like to see as the father of her children. In a recent interview with Vogue Russian tennis player Maria Sharapova spoke about the problem of finding a soul mate and the desire to have children. The sportswoman noted that she can not live with the feeling that she sacrificed one for the sake of the other. "I want to have children, but I'm too focused on work, and frankly, that's why I did not have many relationships, maybe the reason is that I'm a very complicated person." I can not live with the feeling that I sacrificed one For another". "I hate the word balance, because it's 50 to 50, which means that you give only 50 percent of attention to both things", - Sharapova said. At the moment, the 29-year-old Russian tennis player continues to serve a disqualification for drinking meldonia. Recall that in the spring of 2016, the best Russian tennis player in history was disqualified for 2 years for consuming meldonia during the Australian Open. Subsequently, the period of disqualification was reduced - on April 26 she is scheduled to return to court. This will happen at the WTA tournament in Stuttgart, Germany. During the forced break in her career, a Russian millionaire athlete led a very active life. In particular, she took a course in Harvard as a sports manager and presented a new series of confectionery products under her own brand.